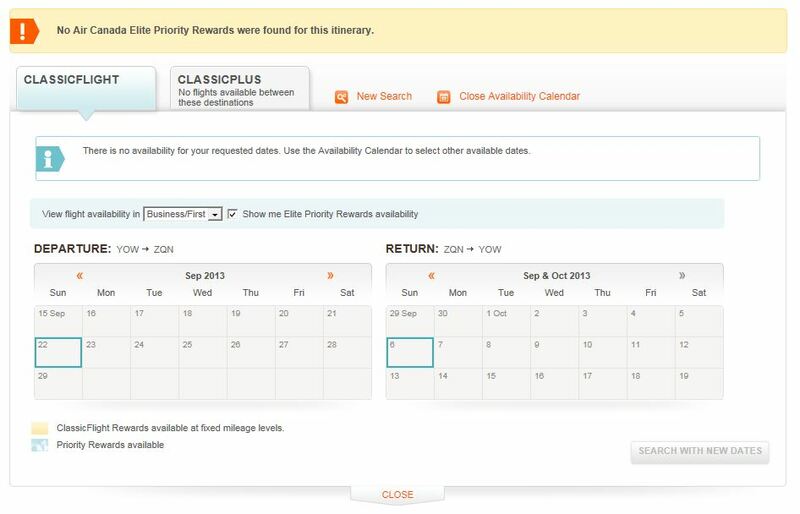 Booking reward flights on Aeroplan – ugh! I have used my Aeroplan miles to book flights to Madrid, Paris, Colorado, New Zealand, et cetera, but I have notice as the airlines add fees, airport fees rise, taxes get added – all of which is not covered – the benefit-value of my miles have degraded significantly with time. Given this degradation, I started shifting my rewards back to financial rewards. Yet, I started looking at using my miles for a major vacation. So I started thinking about booking a flight to New Zealand for a 2-3 week period to see how much the fees will negate the benefit. So looking at what available flights there were, I could find a couple of departing flights and returning flights within the year (shown below – looked out to the fall of 2013), but there were no roundtrip flights that required less than a 5 week vacation. I spent nearly 40 minutes slowly scrolling (waiting for the page to refresh) through the calendar to find nothing is available for the next year. A lot of time used to find nothing. The next choice, given how poor the app works, is to call and pay more to find something that works. Postscript – Looking to Sydney Australia, there are many more choices and costs seem more reasonable (additional fees not covered – 652 CAD$ round trip per person), but does require 135K Miles.